When I plan a bridal shower, I keep in mind the happiness of the bride. It is also important to make sure that the guests that attend the shower are satisfied. After all, these guests spend their time and money on the bride. They should be rewarded with a fun experience. Plus, the bride will get rave reviews from her family and friends about how MEMORABLE the shower was, even months and years after the shower date. One of the ways I make the shower MEMORABLE, is to make the prizes for the game as attractive as possible. 1. Ask the bridesmaids to pitch in $10 - $20 each for the cost of the bridal shower game prizes. You should have at least two prizes for each game that is played (in case there is a tie). Any left over prizes can be won by drawing a name, or by honoring a special guest that has attended the shower (such as the person who traveled the furthest to be there). 2. Have someone shop that is the most frugal and most creative. If you are not frugal or creative, select someone in the bridal party, a friend, or family member, that IS and ask them to assemble the prizes. 3. 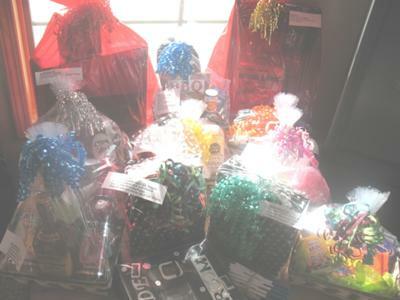 Have all of the prizes wrapped in clear (or see through) gift bags (available at most craft stores) so that the prizes are visable. ignite excitement in the game, making the guests more apt to participate in the games and be more competative. 5. When a guest wins a prize, have someone record who won which prize. The bride will have something to write about in her "Thank you card" later to that particular guest. If you wish, you can also have someone snap a photo of the guest with the prize she has won, and include a copy of the photo in her "Thank you card". Be sure to keep the prizes within your budget. If you try to keep the prizes at $12-$15 each (including the basket and wrap), you can get some very interesting items. Find some great items in closeouts, discount stores and online. Join in and write your own page! It's easy to do. How? Simply click here to return to Bridal Shower Game Prizes.